I used to be using shared hosting for my websites, but lately, as the VPS price become more affordable and faster I start moving some of my websites to the VPS package. There are some pros and cons of using VPS package for my websites. I have better performance website, all VPS package in VULTR are using SSD instead of a conventional hard disk, this surely increases speed or access time to the website which is very good. Have unlimited possibility with the server features, as with VPS we actually manage the server yourself so we can access almost anything on the server except physically of course. Lower price than my previous shared hosting company, which is very good. Send mail need at least 30 days to be activated, we need to ask support to do this, while in my previous hosting provider Sendmail is automatically activated. Need more technical knowledge than shared hosting to operate the server, but as many resources all over the internet, this will not become a problem. OK let's back to our topic whether we need to use Server destroy feature or Server reinstall. This really depends on your needs. When to choose server destroy and server reinstall function? You will be using this if you want to start everything from the scratch, you will need to choose server location, new IP address, new password for administrator. They still keep the IP address, server location, password for administrator, and other basic settings, this is what I like the most. 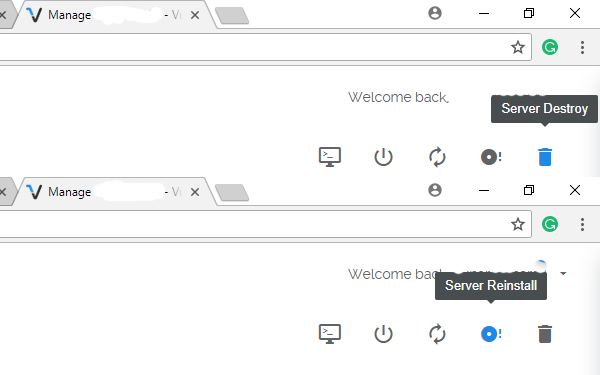 At first, I was using Server Destroy, but later I use Server reinstall feature to install my server from the beginning when something goes wrong as I still keep some basic setting that will save me a lot of time when configuring the server. I hope everything is clear to you now. Sometimes I help my friend via TeamViewer configuring the server in VULTR, so if you want my help just give let me know.